Who doesn't need notebooks? Who doesn't need stupids cats in their life? You absolutely have to check out Stupidcats. Read on to find out more about Michelle, the creator behind Dave and Co! Er, hmmm. Okay, I've drawn and written since I was little, and worked in the printing industry after leaving school. I was introduced to Macs in the late 1980s and ended up moving to London doing technical support on Mac graphic design software, then ended up working in graphic design. Then I moved to Iceland (as you do!) and taught music, whilst drawing and selling my artwork in a little gallery. Seven years later I moved back to the UK and started working in the railway industry (as you do!). I still work in that industry full time, whilst using every free moment I get to work on my art! This is one of my handmade notebooks, featuring Dave the stupidcat! I've always been fascinated with bookbinding - right back to being little and de-construcing books to see how they were made (whoops, sorry books!). I also became seriously addicted to beautiful paper when working as a graphic designer in London. It's only recently that I've had the time to research bookbinding techniques, and start by learning simple pamphlet binding so I could make my own notebooks. I wanted every last bit to be handmade, so my notebooks are hand folded, the holes for stitching are hand punched, and I sew each notebook together with waxed thread. Then they're all pressed overnight, then hand trimmed with a knife. I even screen print the lined paper myself, because you can't buy the beautiful paper I use inside my notebooks pre-printed with lines. The covers are yummy Colorplan card, and each one is hand printed. They are just so cool. I have always want to have a go at book binding. When and how did you learn to do it? It's all self taught. From researching about paper grain, folding, stitching, the best threads to use etc... everything came from hours and hours of research, testing sample materials, making prototypes... It takes me a long time to squeeze all this in around my fulltime job, but I don't like to compromise - I want to make top quality things with top quality materials, doing as much myself as I can rather than outsourcing. I made my first notebooks in September last year. When and why did you decide to turn your creative skills into a business? In the mid-90s I used to sell my drawings in a little gallery in Iceland, but it it wasn't until 2009 after being made redundant that I started drawing again, really to try and relieve the stress of trying to find work. Then I discovered Etsy, and plucked up the courage to open a shop. 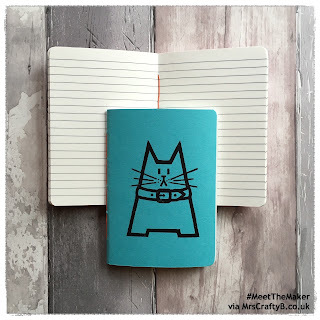 I joined the Craftbritannia team, and met a lot of like-minded creative folk that really helped me gain confidence in myself and my drawing, which helped me hugely begin to believe in myself again after all the stress of the work situation. So thank you, Craftbritannia! I am so glad you continued. So what inspires and motivates you? Inspiration comes from anywhere and everywhere! Motivation... I just want to make things that make people smile and hopefully bring a little bit of pleasure to people's lives! That is such a great reason to do something in life. Where can we find more from you online? We won't be able to resist the cats! Is this year your first at the Handmade Fair? Yes! At the moment, I'm a bit scared! But also really excited! I've only ever done three small fairs before, so this is a big step up and I'm determined to enjoy it! Meeting lots of fellow crafters, a lot of whom I've become acquainted with online through Etsy. It'll be so good to finally meet them for real! It is so strange having an online network and not getting to see them isn't it. So exciting. What will visitors find at your stand? I'll be launching my hand printed tote bags at the fair, and am hoping to run some offers - probably linked to social media. I'm still finalising my plans, so keep your eyes peeled! I'll be on stand W52. What will you be up to between now and the big weekend! Working my full time job whilst desperatley squeezing in time to build up stock and perfect new product ranges! I can't believe you do this alongside full time work. Ok, quick fire round! Rook's Books - I went to a Craft's Council fair in London back in the early 1990s and was mesmerized by the chap sitting quietly at his stand, marking proper leather-bound hardback books. I'd always been fascinated by how books were made, and seeing someone actually doing it was amazing! I remember thinking... "One day..."! Mine (! ), and if I can get away to explore then I'll be visiting The Etsy stand, and fabric stalls - I need to source some yummy fabric ready for my next project, which will be appliqué cushions using my cat designs so I need to source the perfect fabric. Some of my fellow Etsy sellers have stands too, so I'm hoping to have time to drop by their stands too. Currently a gorgeous handmade silver necklace which my other half bought me from Harvest Moon Jewellery on Etsy for my birthday. Anywhere that makes me feel good. Coffee, tea, or real ale! And cake, obviously. My other half, cats, and drawing/writing. Every time I recieve lovely feedback from someone who's bought one of my creations feels like my biggest achievement to date! Crafty explosion of colourful creativity! Michelle, it has been a pleasure. I can't wait to visit your stand at the fair (I have already been mooching on your online store!) We will see you there! Gorgeous notebooks. Can you ever have too many?